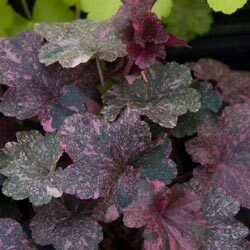 The most exciting new Heuchera to come along in many seasons, these blooms are so heat and humidity tolerant, they'll keep bright even in the dog days of August! By summer, the softly lobed leaves of pure black turn to a royal purple and light pink, even showing cream highlights. Unbelievably showy! 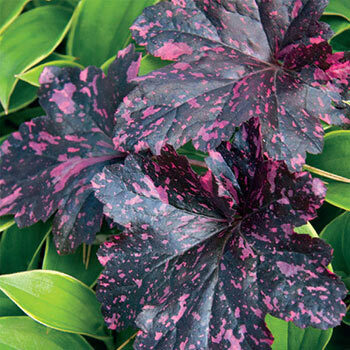 Foliage Type: Shallowed lobed leaves and scalloped edges. Forms neat, rounded mounds of foliage. Flower Form: Tiny bells on slender stems above the neat mounds of foliage. 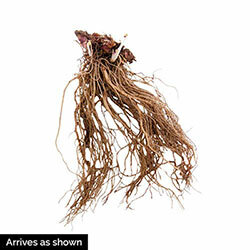 Pruning: After flowering remove spent flower stems to tidy up plants for rest of growing season.